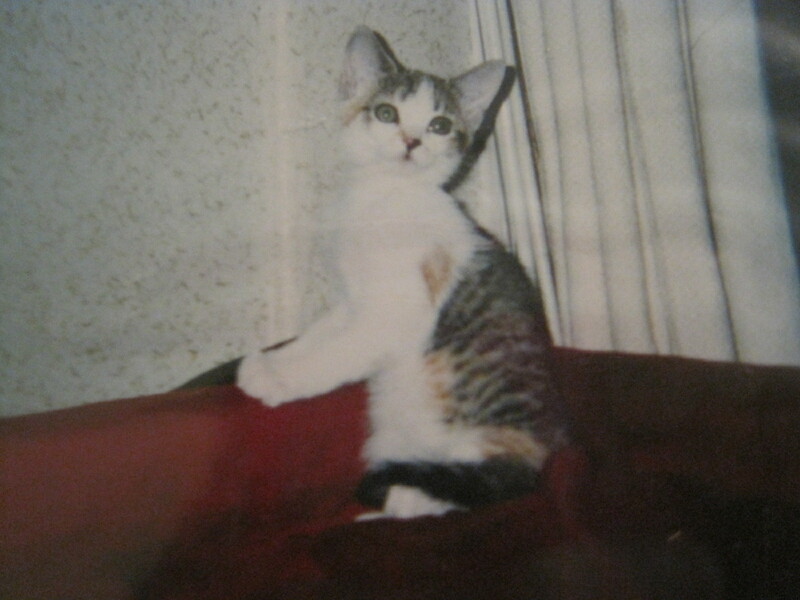 i adopted charlotte when she was a tiny six-week-old kitten, in september 2001. i had just moved to boston the month before, i didn’t know many people yet, & i was lonely. i wanted to adopt a cat. my roommates had a pitbull who was very aggressive with adult animals, but gentle & maternal with baby animals. they suggested that i adopt a kitten if i wanted a cat. they were worried that their pitbull would hurt an adult cat, or even kill it. i was reluctant to adopt a kitten because they are a lot of extra responsibility, & i feel bad for all the adult cats that need homes but are passed over in favor of cute, frisky kittens. i went to angell memorial, just to look at the cats & see what my options were. they only had one kitten, a noisy calico who was climbing the bars of her cage. i asked to hold her & she burrowed into my shoulder & put her paws on my neck, like she was trying to hug me. she meowed & meowed. her orange patches hadn’t completely come in yet & were still kind of yellow-ish. she had big ears & huge feet & runny eyes & fleas. she was a mess & i didn’t think she was cute at all. & her name was sprinkle, which is the dumbest name of all time. but my roommate insisted that if i wanted a cat, this kitten was my only option. while i was waiting for the adoption paperwork to be processed, four different people approached me & asked if they could adopt sprinkle instead. they all wanted a kitten–any kitten, & sprinkle was the only kitten at the shelter that day. instead, i took her home. i renamed her charlotte, after charlotte perkins gilman, author of “herland” & “the yellow wallpaper”. she won me over pretty quickly when i saw how much she loved to sleep in weird places, like milk crates or the inside of discarded pants left on the floor or the edge of the box spring after the mattress had shifted, creating a little shelf. & she loved to sleep on her back. & one morning she sat on the windowsill, dipping her paw into a glass of water & licking it off. & then she misjudged the edge of the cup & dumped it all over my husband at the time, who was asleep. another time, she got into a box of five hundred zines i’d just copied & collated, but not yet stapled. i came home to the pages strewn all over the apartment & her asleep in the middle of the chaos. i became very relieved that i had adopted charlotte rather than letting any of the other people at angell memorial that day have her, because she proved to have a very difficult personality & i felt that i was the only one who really appreciated it. she was angry & grumpy & often vicious. i could always tell when she was about to attack, but other people failed to read her cues in time & were scratched when they petted her. i acquired a four-poster doll bed that she liked to sleep in. she grew to be enormous–thick-necked like a football player, with plenty of heft to match. i had to put her carrier in a wagon & pull it to vet appointments because she was too heavy to carry. she liked to sleep on my pillow & keep my head warm at night. 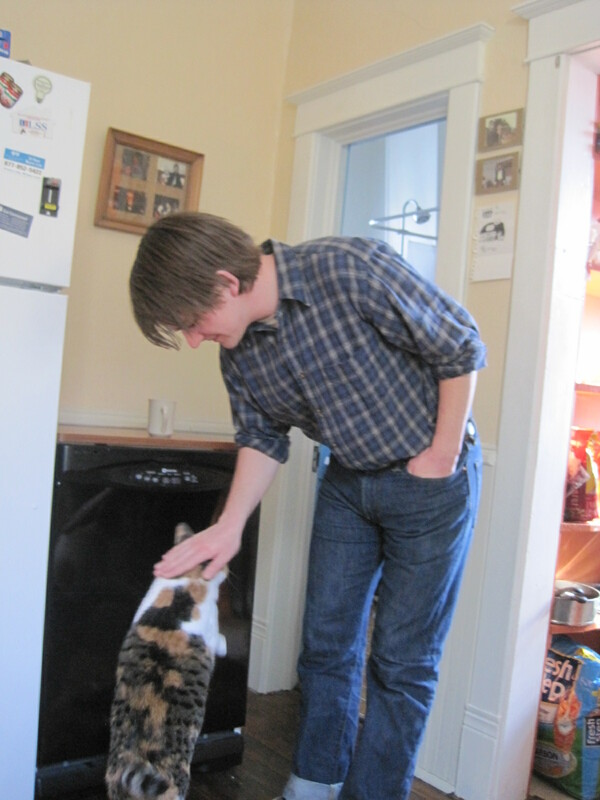 when i started dating jared, i knew he was a keeper by the way he interacted with charlotte. one of the first time they ever met, he went in to scratch her ears. “look out!” i said, “she’s not friendly.” but to my surprise, she rubbed her head on his hand. every time she saw him, she would love on him, & he borrowed her once for a month to try to address the mouse problem in his apartment. she his behind the stereo & terrified everyone. as far as we know, she never caught a mouse there. she did catch mice though. once she caught one & left it on my bed while my sheets were in the laundry. i didn’t notice & put the sheets back on the bed over the mouse carcass. a few days later, i noticed a weird smell in the room. i scrubbed it top to bottom, but the smell just got worse. the next time i washed my sheets, i discovered the flattened, smelly mouse body. i’ve ever told that story before because it’s so gross, but charlotte was just trying to leave me a present. 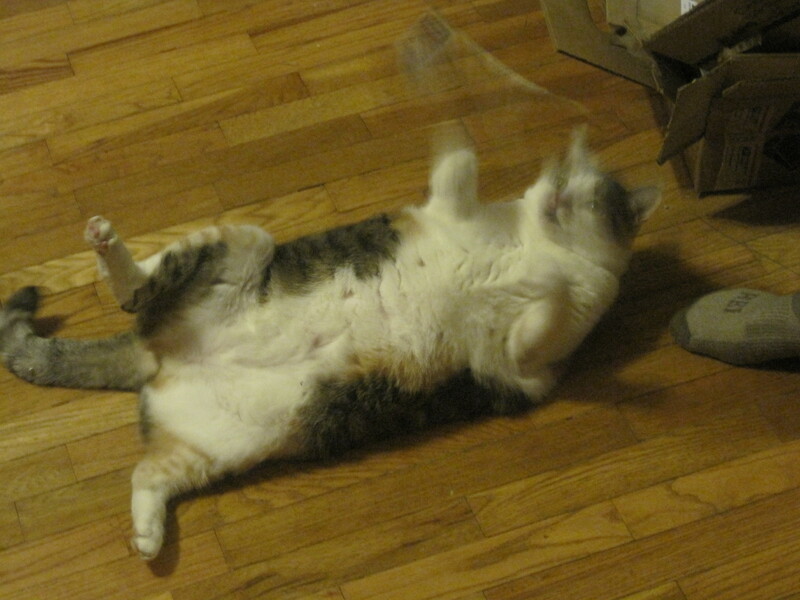 another time she chased a mouse into the bedroom while my husband-at-the-time & i were watching “apocalypse now”. i started screaming & he sent me downstairs while he tried to catch it. for 45 minutes, i heard all manner of crashing & banging & swearing from the bedroom. finally he gave me the all-clear to come back, & when i walked into the room, i found that he had destroyed it in his attempt to catch the mouse. all the dresser drawers were pulled out & dumped on the floor, the desk chairs were overturned, the mattress was leaning against one wall & the box springs against the other with blankets & pillows strewn everywhere. & charlotte just looked at us & purred. charlotte started to get sick right around the same time i started getting sick with pre-eclampsia. she started drinking more water & spending more time in her litterbox. we took her to the vet & the diagnosis was mild kidney disease. we knew that there’s no cure for this, & that it would get progressively worse, & that it’s the kind of thing that kills cats, but it was “mild” & she was only eleven years old. that’s awfully young to be diagnosed with any stage of kidney disease, but we hoped she still had a few good years left in her. i wanted her to have a relationship with ramona. unfortunately, her condition continued to deteriorate. she started losing weight. every time i petted her, her bones were more apparent. she started to limp occasionally, or even stumble. i noticed that she had pretty much stopped eating. occasionally i would see her eat a few pieces of kibble, but a cat who could once eat an entire bowl of food in a single sitting & then lick the bottom to make sure she got all the kibble dust was suddenly leaving entire meals untouched. last night i noticed blood in her litterbox. the next time she tried to use it, we realized that she wasn’t urinating at all–only blood was coming out. & when jared cleaned the box, we realized that she hadn’t been defecating in a few days. we rushed her to the animal hospital. when they checked her vitals, they found her temperature dangerously low, & she had a heart murmur. the vet explained that when the kidneys shut down, they stop communicating with the bone marrow & the body stops making new blood. anemia sets in, & as the old blood struggles to keep the heart going, a murmur can develop. it was a sign that charlotte was very sick. they did a blood panel & her kidney function came back very bad. the vet estimated that she only had about 10% kidney function. she was severely dehydrated & her body was dumping calcium. the vet said we could try hospitalizing her & giving her IV fluids to try to restart her kidneys. there was no guarantee it would work, & if it did, she would require weekly or even daily IV fluids for the rest of her life. or we could euthanize. obviously this was a horrible decision to have to make, but we decided to euthanize. we chose to visit with her before the injection & to stay with her during. i petted her & petted her while she laid here with her head on her paws. she had no fight in her at all. she just looked at me & rested. she was obviously really sick & in pain. the overdose worked really quickly–too quickly, maybe. i didn’t want to let her go. i stayed with her for a long time after & just cried & cried & cried. which was kind of awful because charlotte used to always run away from me when i cried. watching her just lay there while i cried was proof that she was gone. i chose to have her cremated & to have her ashes returned to me with a memorial paw print. i’m not sure what i will do with the ashes. probably just keep them. i never got any of my dad’s ashes–my mom just dumped them in the backyard one night in a fit of pique–so i don’t have too much experience with this. but i know i didn’t want to bury charlotte in the backyard of a rental property or have her ashes spread at some pet cemetery in kansas city. i have a little locket with a cat on it. i might put some of the ashes in that with a photo of her. i will definitely get a memorial tattoo for her once i am ready to think about what i want it to look like. charlotte was my constant companion for eleven & a half years. together we lived all over boston, in minneapolis, & in lawrence. she always knew when people were jerks & she was always there to cuddle with me (as long as i wasn’t crying). yes, i have scars from her scratches & bites, but i’m happy because they show that we were together. charlotte is the best cat i’ve ever known. i miss her more than i can say. I am crying. I am so sorry. As a new mom and a cat freak i can’t imagine. I am so, so sorry for your loss. I think of Charlotte & the crab claws video you made whenever I’m volunteering at Springfarm animal shelter and the cats there get so mad they snort-hiss. She was a lucky cat to have you as her caretaker & best friend. thank you. we really miss her, snort-hisses & all. I’m so sorry. 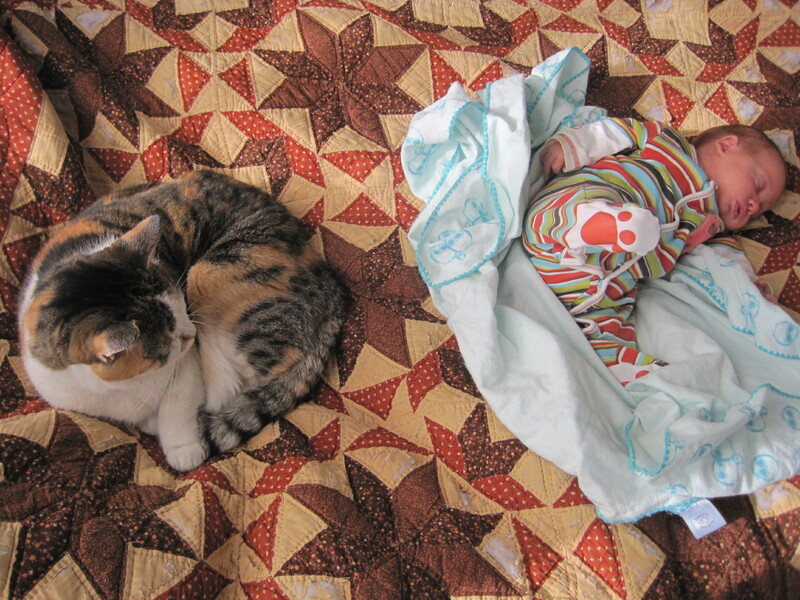 My good friends also lost their awesome, beloved cat a few weeks after their baby was born. So awful. 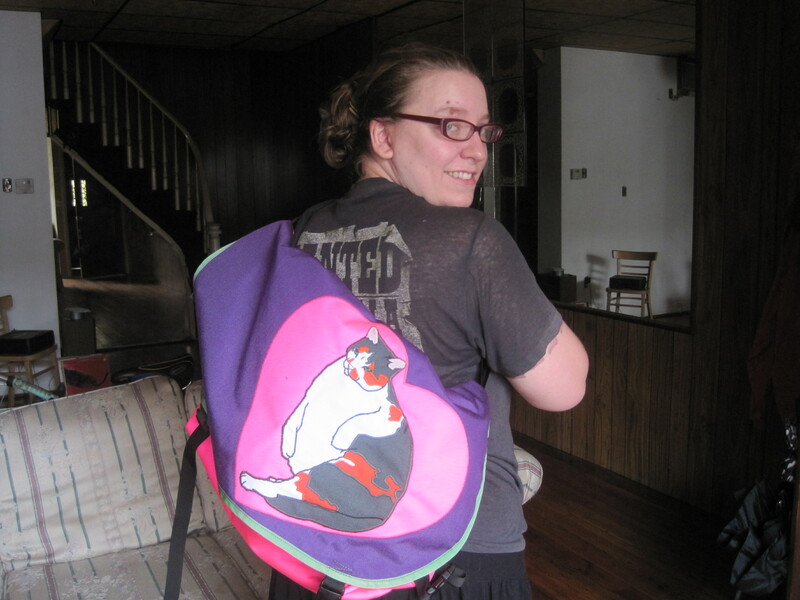 Your Charlotte messenger bag is amazing, by the way. thanks for the condolences. & for the compliments on the bag. i’ve been using it a lot lately, to honor her. I’m so sorry about Charlotte. I’m so sorry for your loss. I had my cat cremated too, and it helps a lot to have him with me. I hope that it helps you too. Thank you for sharing your lovely stories and pictures of Charlotte. 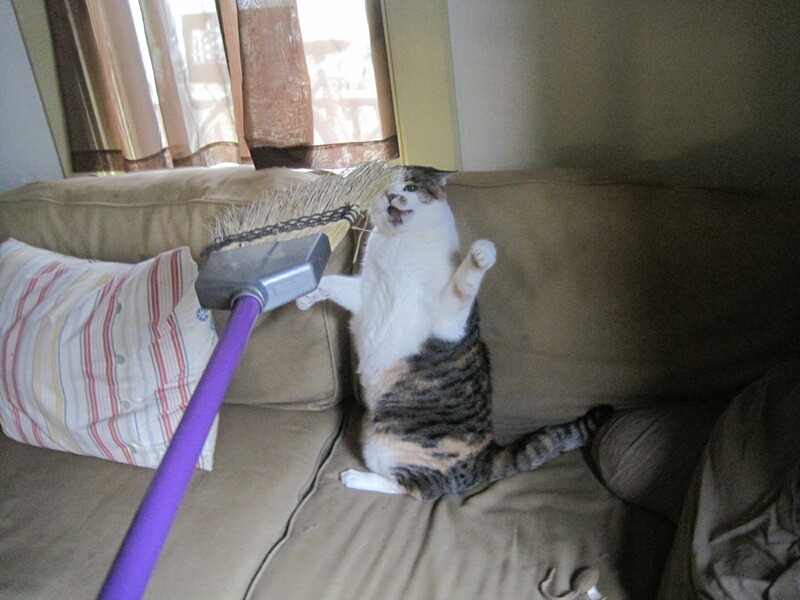 I can’t get over how great the picture of her and the broom is, or the picture of her and Ramona. I’m really glad the two got to meet at least. thanks. her ashes haven’t arrived yet, but i think it will help to be able to have them. i also found one of her claws while i was cleaning the other day (she would shed the exteriors regularly, like a snakeskin), & i’m going to hold on to that too. i’m glad that ramona & charlotte at least got to meet, though i’m sad they won’t have a relationship. Kitties are the best. As a cat lover and a mother to old pets, this brought tears to my eyes. I loved all the photos you shared. thank you. cats are indeed the best. this seriously made me cry. i am so incredibly sorry for you loss. charlotte was very much like my cat in looks and personality, even down to the adopting him at ~6 weeks old in september 2001. when he became sick this summer, i completely lost it. i can only imagine how painful this must be for you. i know any condolences sound trite when you are in pain, but please know that my thoughts are with you as the death of a pet is just as hard as the death of a close friend or loved one. thanks. it has been really hard. i’ve barely been sleeping because it’s just too lonely in the house without her. i’ve stopped crying every day, but every day at 9am & 9pm, i always think, “time to feed charlotte!…oh. wait.” or when i come home from being out somewhere, i’m surprised when she’s not running to the door to greet me. the night she died, when i went to bed, i felt something that felt exactly like charlotte jumping on to the bed & walking toward me. i don’t necessarily believe in ghosts or anything, but it made me feel better to think that was her way of saying goodbye. Sorry to hear about Charlotte. I can tell she was more than just your cat to you. thanks. i appreciate the condolences. I’ve regularly read your blog for a few years (and as a side note, we have MO/KS friends in common) and I once sent my zine to you when you ran the distro–I’ve always kinda felt like we were friends by proxy, haha! Your Charlotte stories were the icing on that cake to this blog for me since I had a similar cat friend in my life. Stella was a little firey eight year old Russian Blue, with an attitude much like Ms Charlotte. 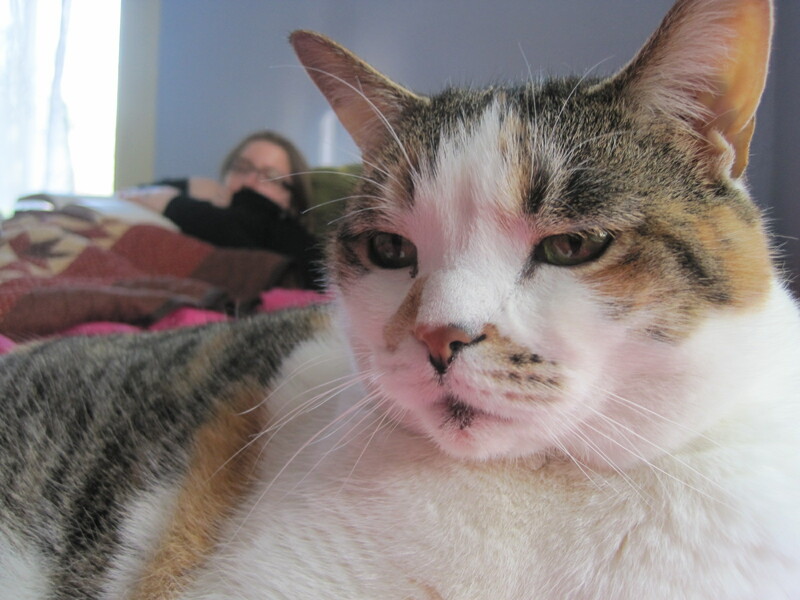 Strangely enough, this past October, Stella also fell ill suddenly with kidney failure. It was like she had hung on through my latest battles (with ovarian cancer) to make sure I made it through. I had to have her put to sleep as well. Anyway, I am so sorry for your loss. I’m glad little Ramona got to feel her soft fur and tuff saucy attitude. There is nothing like losing an animal friend. She will be missed and remembered, for certain. thanks. i appreciate the condolences. & i remember your zine & remember some mutual friends saying they knew you. i meant to update about the charlotte thing. her regular vet was faxed her labwork from the night she died & she said that charlotte was not a cat that was in renal failure. she said the labwork indicated kidney disease, but not at the catastrophic level the vet at the animal hospital had told us she was experiencing. the animal hospital vet said she was dumping calcium & had a heart murmur & all this end-stage renal failure stuff, & the regular vet said none of that was in the report. though it was clear that charlotte was very, very sick. the regular vet thinks that her cancer had probably spread beyond her tongue & that’s what was making her sick, & the only treatment for the kind of cancer she had was a medication that is contraindicated in cats with even mild kidney disease. so…we still really had no choice but to euthanize, but it’s weird that these two vets interpreted the same lab results so differently. i was pretty upset about it at first.